Still abundant in autumn, mackerel is richly flavoured, hardy and bullish enough to stand up to heavy spicing and relatively aggressive cooking," it says in the cookbook. "That is exactly what happens here. A spicy paste is applied, then the fish is grilled until the spices sizzle and the flesh just begins to flake. 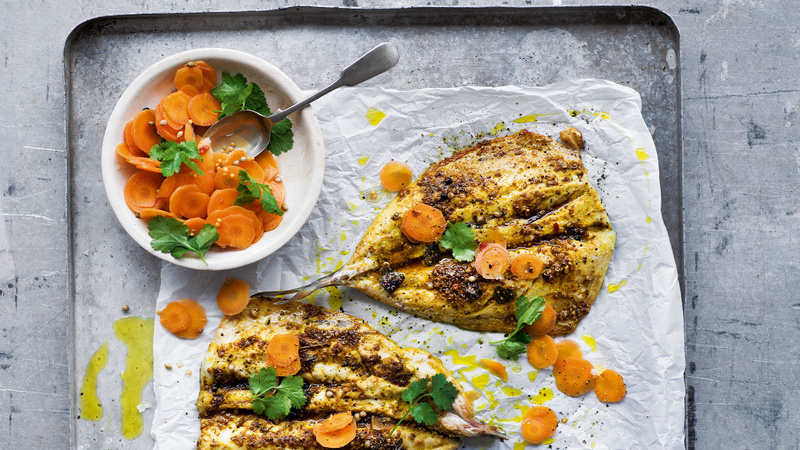 A salad of pickled carrots and coriander helps to cleanse the palate between each bite, cutting through the spice and oiliness of the mackerel. It's not difficult to butterfly the fish at home, removing the fillets from the bones in one piece, and leaving the tail on to keep them together, but ask the fishmonger to do it if you prefer." Put the sliced carrots in a container that fits them snugly. Heat the vinegar in a pan with 50ml water to just below a simmer. Add the sugar, peppercorns, salt, mustard and coriander seeds, stir to ensure the sugar has dissolved completely, and pour the mixture over the carrots. Cover and leave to cool for at least 1 hour, ideally more (up to 8). Line a baking tray with greaseproof paper. Lay the fish on top, skin-side-down. Combine the garlic, ginger, Spice Mountain Mauritius masala, oil and a good pinch of salt and spread this over the fish flesh. Refrigerate for 1 hour. Tip: if you can't find Spice Mountain's Mauritius masala, grind half a teaspoon each of cumin, coriander, yellow mustard seeds and red chilli flakes in a pestle and mortar, and mix with half a teaspoon of ground turmeric and ginger, plus a little pepper. Turn the grill on to its hottest setting, set a shelf roughly 6-8cm from the heat source and close the oven door. Allow the oven to heat up for 10 minutes, turn your extraction fan on, then slide in the tray of mackerel and close the door. Grill for 6-7 minutes, until the spice mix is sizzling and turning golden and the fish begins to release some of its oils. Remove from the oven and allow to rest for 3 minutes. Mix the coriander leaves and pickled carrots (without their pickling juices) and serve alongside the fish.